The town of Rheinberg lies in the west of Germany approx 85kms to the north of Koln. From the A57 motorway Koln to Goch take exit 7 (Ausfahrt 7) RHEINBERG and follow the B510 direction KAMP LINTFORT. After approx 800m turn right onto AM ENGLISCHEN FRIEDHOF (CWGC sign). 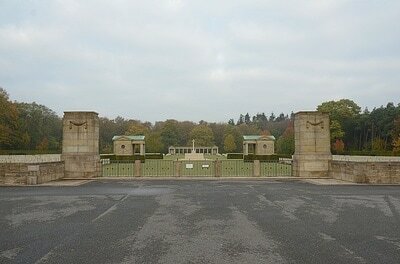 The cemetery can be found approx 200m at the end of this road. 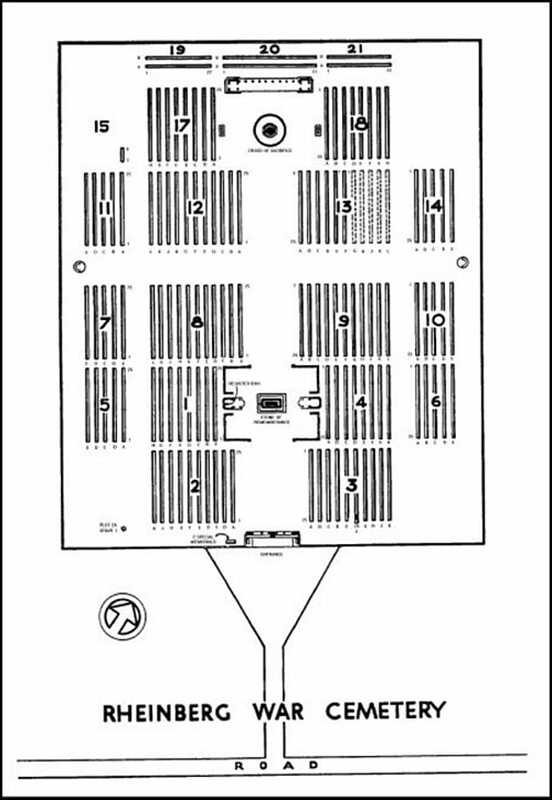 Wheelchair access possible via the main entrance. 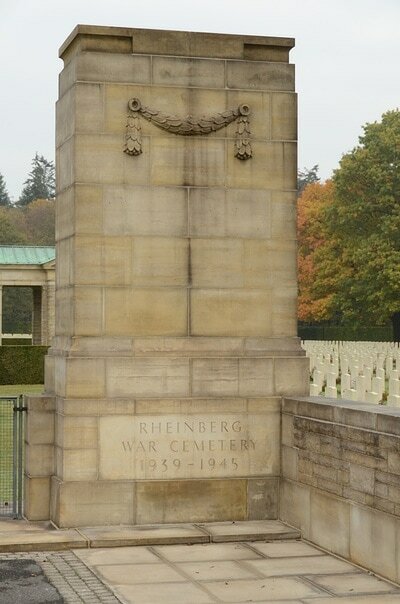 The site of Rheinberg War Cemetery was chosen in April 1946 by the Army Graves Service for the assembly of Commonwealth graves recovered from numerous German cemeteries in the area. 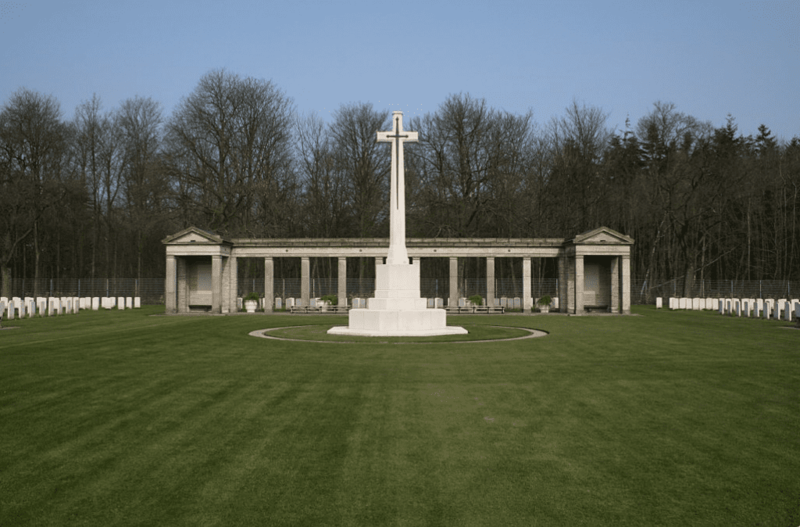 The majority of those now buried in the cemetery were airmen, whose graves were brought in from Dusseldorf, Krefeld, Munchen-Gladbach, Essen, Aachen and Dortmund; 450 graves were from Cologne alone. The men of the other fighting services buried here mostly lost their lives during the battle of the Rhineland, or in the advance from the Rhine to the Elbe. There are now 3,330 Commonwealth servicemen of the Second World War buried or commemorated at Rheinberg War Cemetery. 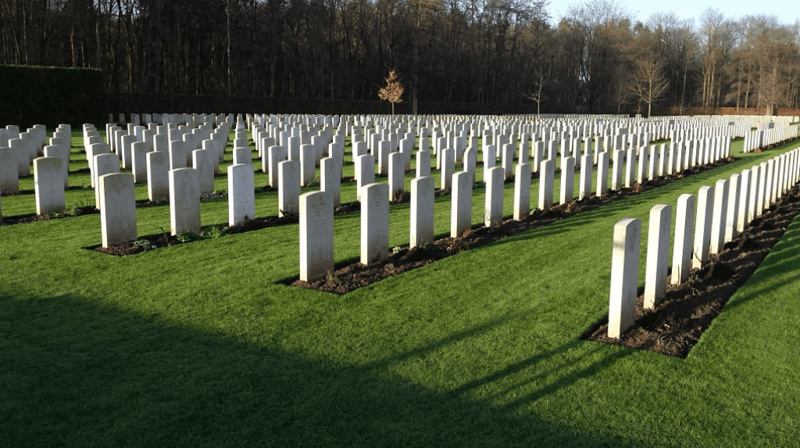 158 of the burials are unidentified. 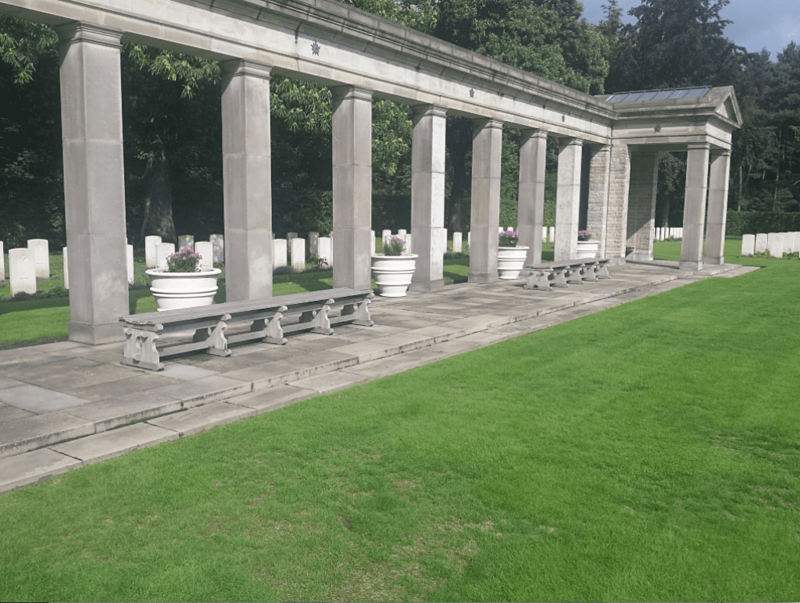 There are also nine war graves of other nationalities, most of them Polish. 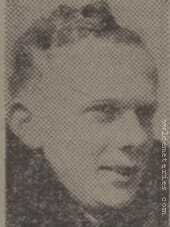 Son of Arthur Robert and Lillian Palmer, of Gravesend, Kent; brother of Douglas Palmer. Citation: The following is taken from the London Gazette of March 20th 1945 :- This officer had completed 110 bombing missions. 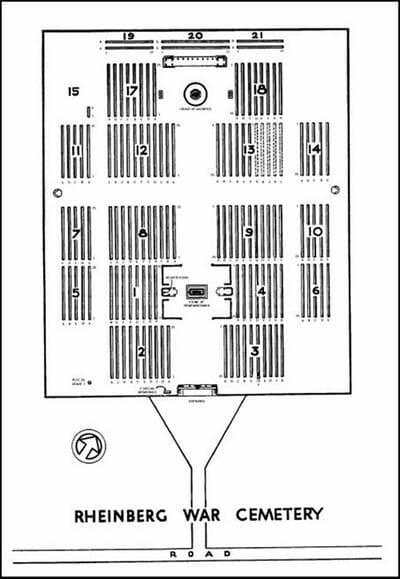 Most of them involved deep penetration of heavily defended territory; many were low-level "marking" operations against vital targets; all were executed with tenacity, high courage and great accuracy, so that he was invariably selected for particularly important missions. 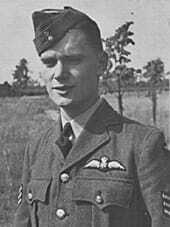 The finest example of his courage and determination was on December 23rd 1944, when he led a formation of Lancasters to attack the marshalling yards at Cologne in daylight. Before the target was reached heavy anti-aircraft fire was encountered and two of his plane's engines were set on fire. 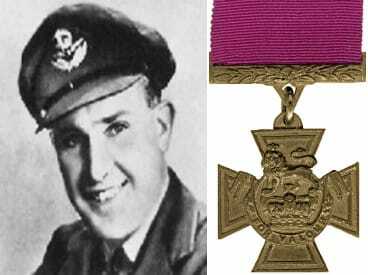 Squadron Leader Palmer ignored the double risk of fire and explosion in his aircraft and kept on. He made a perfect approach and his bombs hit the target. His aircraft was last seen spiralling to the earth in flames. 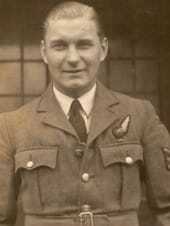 Squadron Leader Palmer was an outstanding pilot. He displayed conspicuous bravery. His record of prolonged and heroic endeavour is beyond praise. 4th April 1945, aged 19. 23rd September 1943, aged 21. 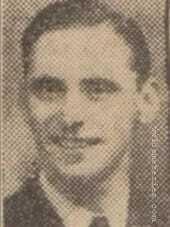 Leslie Grahame Goodley, D. F. C.
9th March 1943, aged 22. Extract taken from the Cornish and Devon Post dated 20th July 1940. Flying Officer Ian Haydon, a promising Camelfordian, 23 years of age, is reported to have been killed whilst returning from an action against the enemy in Flanders in June. Shortly before his last flight he was spoken to by H.M. The King, who especially congratulated him on the excellence of his work with the R.A.F. At first posted as “missing” confirmation of his death has now been received. The eldest son of Dr. W. Eric Haydon (the Medical Officer of Health for Camelford district) and Mrs Haydon of Garmoe Camelford. 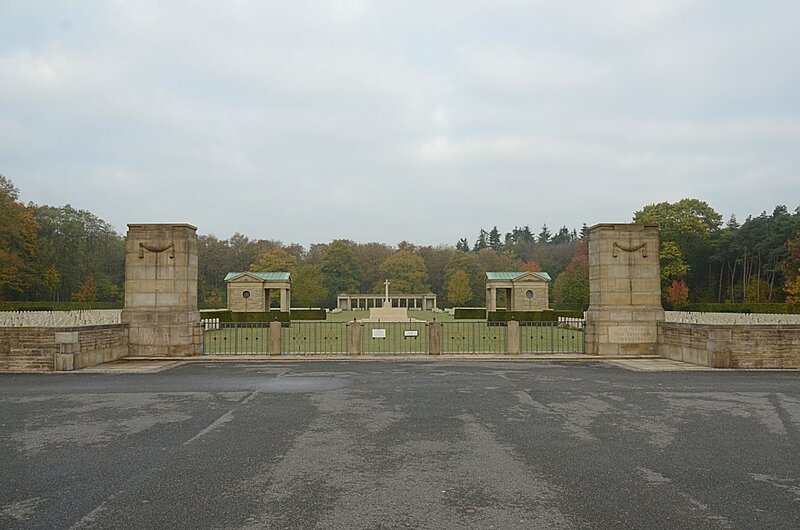 Flight Officer Haydon received his early education at Sir James Smith’s Grammar School, Brackley Northants, where he won a prefectship and gained his rugger colours in 1933. During 1934 he became head prefect and captained the school. He was held in such high esteem that his headmaster (Mr. A.H. Bishop) on his leaving school, selected him as his private secretary. In 1936 he commenced training for a commission in the R.A.F. which he obtained in the following year. After holding the rank of acting pilot-officer and then to flying-officer. 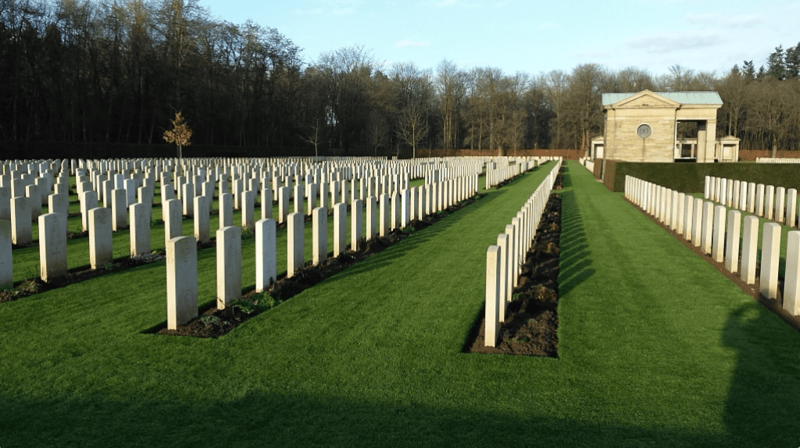 At the time of his death he was due to be promoted to the rank of flight-lieutenant. He had a very satisfactory record with the R.A.F. and was greatly respected by all with whom he worked. Since the outbreak of war he had many fine pieces of work to his credit. 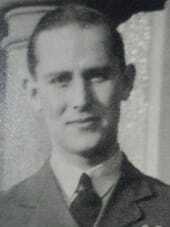 Flying Officer Haydon was married in November 1938, to Miss Beryl Gunst only daughter of Mr. and Mrs. Gunst of Canonbury, London. 11th September 1942, aged 23. Son of John Bright Higginson and Frances Ann Higginson, of Westmount, Montreal, Province of Quebec, Canada. 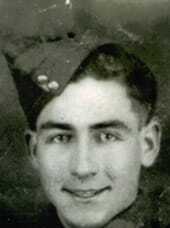 John Blake Higginson - KIA - operation Dusseldorf, Sept. 11, 1942 on maiden sortie. 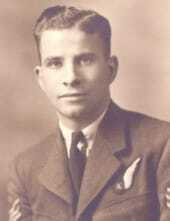 Pilot Creighton Ogilvie ordered Navigator Laurie Hedley to bail out (he survived as a POW) - no communication available to crew in the back but there was a fire. As far as I can tell the pilot, although not injured at the time refused to leave his crew and died with the rest of his men. 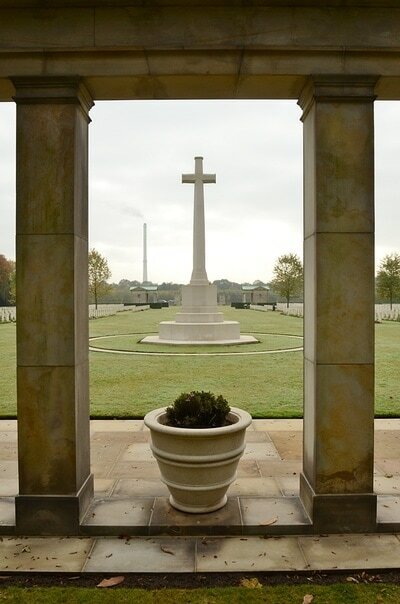 Picture and information courtesy of Peggy Higginson, loving niece of John Blake Higginson - forever remembered. Much thanks to Brian Ogilvie for gathering so much information on this, my Uncles last day. 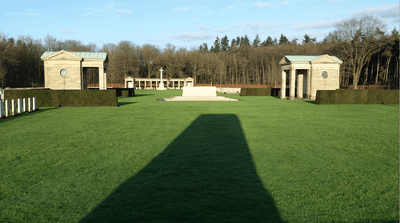 23rd December 1944, aged 21. 31st March 1944, aged 23. Son of Thomas and Gertrude Ellen Salt of Littleover. Derby.